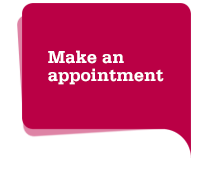 If you contact us for help with a drug and/or alcohol problem, we’ll offer you an appointment for an assessment. If you get in touch with us for help with an anxiety or depression problem, we’ll book you an initial telephone assessment. We will also send you a copy of the questionnaire used for the assessment so that you can prepare the answers beforehand. Alternatively, if you get in touch to book a place on the ‘Talking therapies’ Introduction sessions, we will inform you of your place at the next available session and send you the details.